to take up the post of Matron in one of the Social Care Homes for Elderly men. Sister Shuck commenced her training at Middlewood in April 1936 and remained until she left in 1945 in order to get married and raise a family. 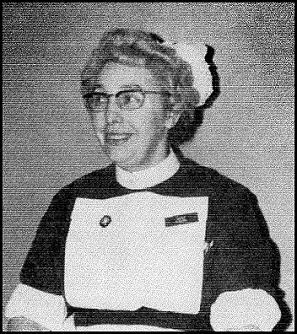 Returning in November 1947, she worked part-time until 1959, when she was promoted to Ward Sister. 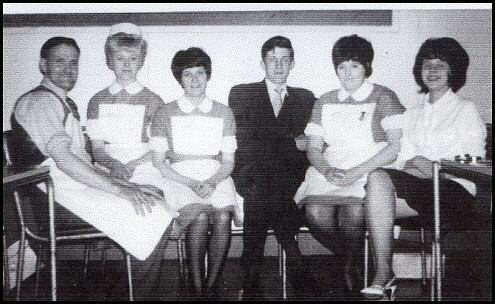 She began on ward 26 before the upgrading of that ward, and was involved in the commencement of an intense habit-training programme for the patients, which eventually led to the formation of an occupational therapy group. 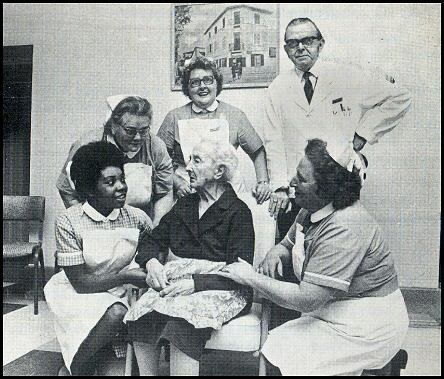 Eventually she moved to ward 19 where she remained for six years, and again started group activities, and again helped organise one of the first holidays to Skegness. 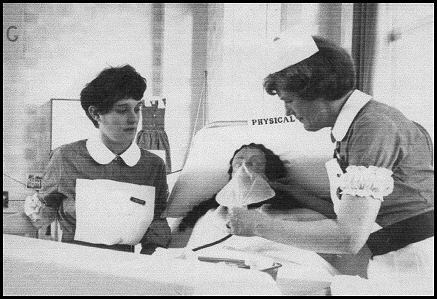 Sister Shuck also worked on ward 27 and 13, and then eventually back to the upgraded ward 19 until she left the hospital. Sister Shuck was a founder-member of the late lamented dramatic society, playing in several farces and usually ending up in a cupboard or, as one play, stabbed and poisoned. The home to which Mrs Shuck has gone has only recently been opened by the Local Authority, and the responsibility of organising the unit will be hers. Photo & Information extracted from the 'Contact' Middlewood magazine printed in 1970. Supplied by Howard Bottom. 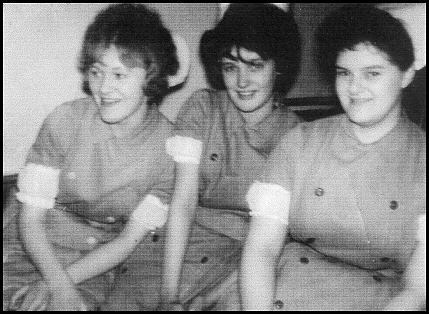 These are the smiling faces of Cadet Nurses in early 1960's. Carol Walker and Bessie Agus with a willing model in classroom training. Early 1960's. Photo supplied by Howard Bottom. Students in training in 1965. Walter, Kath, Carol, Ian, Susan and Pat. 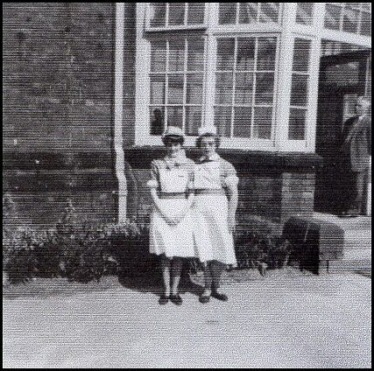 Carol Walker (left) and work colleague outside Ward 12. At a recent conference, Dr. T. P. Riordan, read the attached poetry and gave an explanation as to its finding. Apparently, the author was a mute, inaccessible, physio-geriatric, who was seen to scribble from time to time. After her death, her locker was emptied and this feeling inscription of her life found. What do you see nurses, what do you see? Are you thinking when you are looking at me. A crabbit old woman, not very wise. Uncertain of habit with far-away eyes. Who dribbles her food and makes no reply. When you say in a loud voice. 'I do wish you'd try'. and forever is losing a stocking or shoe. Who unresisting or not, lets you do as you will. With bathing and feeding, the long day to fill. Is that what you're thinking, is that what you see? Then open your eyes nurse, you are not looking at me. I'll tell you who I am as I sit here so still. As I use at your bidding, as I eat at your will. I'm a small child of ten with a father and mother. Brothers and sisters who love one another. dreaming that soon now a lover she'll meet. A bride soon at twenty, my heart gives a leap. Remembering the bows that I promised to keep. At twenty-five now I have young of my own. Who needs me to build a secure happy home. bound to each other with ties that should last. but my man stays beside me to see I don't mourn. again we know children, my loved one and me. I look at the future, I shudder with dread. and I think of the years and the love that I've known. 'tis her jest' to make old age look like a fool. there is now a stone where once I had a heart. and now and again my battered heart swells. and I'm loving and living life over again. and accept the stark fact that nothing can last. So open your eyes nurses, open and see. Not a crabbit old woman, look closer see ME. Chief Occupational Therapist of the Industrial Unit of the hospital. This is Mrs Rose Minnie Moore who is 100 years old. Mr. Vincent was born and educated in Sheffield and worked for 5 years in the Pathology and Bacteriology Department at the Sheffield University before coming to Middlewood in 1926. His appointment coincided with that of Dr F. T. Thorpe’s when Dr W. J. N. Vincent was the medical superintendent. 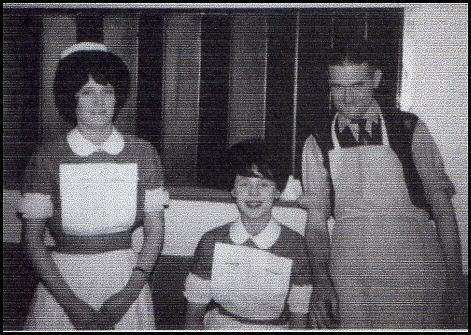 The laboratory was staffed by four people and served both Middlewood and Wharncliffe Hospitals. It played a vital part in all diagnoses and treatment and apart from routine laboratory processes and some bio-chemistry, it did a great deal of work in connection with blood transfusion and haematology. Mr Vincent has been teaching haematology under the local education authority for the past 20 years. He was the first chairman of the professional institute (Sheffield Branch) and is today its treasurer. He was also an examiner for the institute since 1941.His present hobbies are photography, motoring, gardening and reading. In past years he has been a keen sportsman participating in racing-cycling, football, cricket, hockey, tennis and badminton. He is married with one daughter. Illustration and article extracted from the 'Contact' Middlewood magazine published in 1964.